Last month I returned from an enlightening trip to Indonesia where I met with many diverse health and wellness experts. One of my absolute favorite conversations was with Executive Chef Made from Fivelements in Ubud, Bali. He is a native Balinese chef, both classically trained in French cooking as well as a certified raw food chef. He has such an inspiring and passionate personality that I ate a raw food diet for the next few days after our chat! Check out this quick 15 second clip below, and don’t worry, so much more info will be available after the “Vegan on a Jet Plane: Ubud, Bali” episode is edited next year. It will include health tips and knowledge from the Balinese culture that you can incorporate in your own life, wherever you live. I can’t wait to share! In the meantime, below is the short clip along with some interview questions and Executive Chef Made’s answers. Enjoy! In many places in the world, there are no (or very few) raw food restaurants. Can you tell me a little about raw food? There is a lot of raw food here [in Bali], especially in Ubud. Here we shop local and organic. Raw food teaches us to use more locally, because we also want to help the small farmer, and the small farmer will help the earth. It is also a way we can increase the farmer economy, so we use only local product. We do not keep food for a long time, we buy food everyday. We order daily because we want to keep the freshness, crunchiness, and most importantly the nutrients. So raw food is great for you, because that is what our body needs actually. What is one of your favorite ingredients to “cook” with? Avocado for me, I love avocado. Even though sometimes people say no to avocado because of fat, but it has omega-3s that you need for your body. Since we use local foods, sometimes we do not have avocado here. Avocado I love, I can eat it plain without anything. Can you tell me a little about your own diet? I’ve been eating raw food for seven years already. The owner sent me to California to go to the Ft. Bragg Living Light School, it was great for me to learn something new. When you compare the raw food to the cooked food, for me, raw food is more challenging. More challenging because we talk about nutrients, we talk about our life, talk about our body, talk about our health. My family and I eat 50% raw and 50% vegetarian. No animal or dairy products. So I feel great now. I don’t know it is…it is like magic for me. How is it like magic? Oh my goodness…it is perfect for me. When I was in California, during my two weeks in the school, I lost 7 kilo. You can imagine, 7 kilo! But I still have energy; I still can wake up at 4 in the morning, so it has changed my life perfectly. I’ll tell you I had a problem with my life, in the first 25 years of my life, I couldn’t sleep well, I would just sleep 3 or 4 hours a night. I had a problem with my digestion; I could not go to the toilet for a week. It was a big problem for me. When I changed my diet, everything is perfect, its like my life is perfect. It is beautiful for me, that’s why I want to share with other people, my friends, my neighbors, all our guests here. I talk about raw food; raw food is really amazing for our life, so that is why I’m still talking about it right now! Yeah, you know, when you’re doing raw food actually you have to do with passion. Really with passion, and also for me, what we are doing here is really from our heart. When it is really from the heart, in whatever we are doing, it becomes our feeling. You know, and then the last ingredient for me is love. You want to transport the love to our customer, and then they will feel there is real harmony, you know? That is why it is still a vegetable but the tastes you can taste are better than the cooked food. More flavorful! And also the best part we get is really the nutrients. Raw food is really 100% nutrients and the life force of the enzyme that is perfect for the human being. If you compare to cooking, with cooking you kill the enzyme and destroy 70% of the nutrients. So when you eat raw, you can get the feeling of the food, and it is good for your health. For me it is perfect, I think that is the best thing you can do. To receive more updates about “Vegan on a Jet Plane,” join the mailing list here. 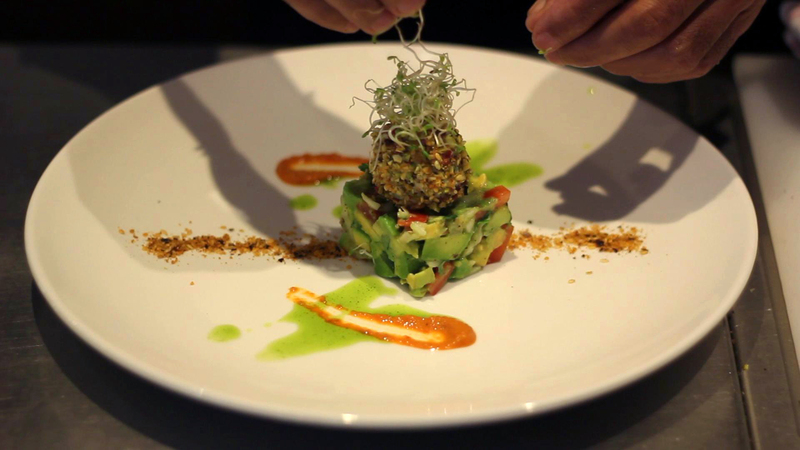 This entry was posted in Travel and tagged avocado, bali, chef, chef made, health benefits, raw, raw chef, vegan, vegan on a jet plane, video.